Every pharmaceutical team faces compliance challenges that are common to the pharmaceutical industry. In the prescription opioid business, accurate and precise communication is really important. The company is required to keep pace with product monographs and information prescription provided by the government which is also forever-changing. When government regulations for any product change, the learning content for that specific topic also expires. Employees, thereby, need to be trained again in that area. Therefore, it becomes important for the pharmaceutical company to ensure that partners and employees stay up-to-date. In case this is not achieved, the company risks deliverance of outdated learning content. This could weaken the training program and open the door of the organization to the consequences of being out of compliance. Pharmaceutical organizations today are struggling with problems of increased compliance regulations within their staffing and operations. The pharmaceutical industry is regulated by several laws and regulations to guarantee the safety and effectiveness of its products. Along with SOP (Standard Operating Procedure) training, cGMP (Current Good Manufacturing Practices) training and Safety and Environment training are also made compulsory to ensure that workers are prepared to operate within the industry guidelines. As the training process is continuous, it becomes mandatory to record and document all trainings conducted for the purpose of detailed audits. Non-compliance not only has severe legal consequence, it also impacts production quality and results in losses due to incompetence. Inconveniences due to non-compliance can be avoided with the help of a top-class learning management system, also known as an LMS. 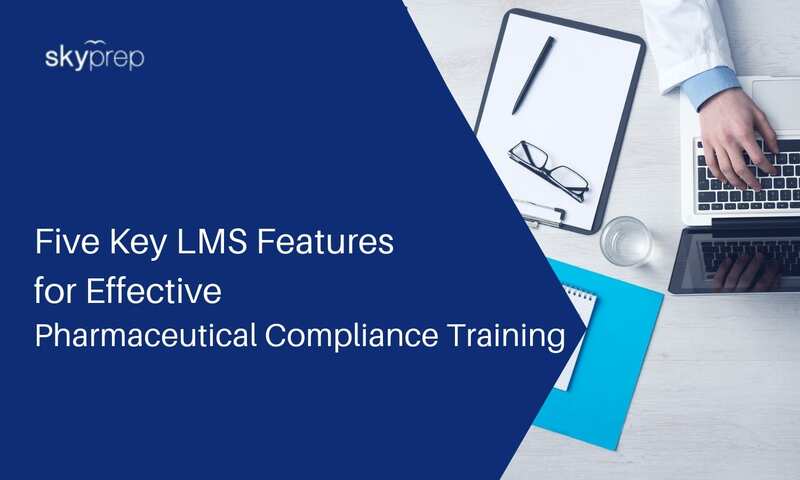 An LMS not only delivers e-learning courses but an efficient LMS can even help in meeting the requirements of compliance in the pharmaceutical industry which is heavily regulated. How to use LMS for Pharmaceutical Compliance? Online learning management systems provide social capabilities for enhancing the learning experience. These may include chat forums and group discussions, which support general and specific learning across departments. Check out our compliance features here! Compliance can be a major headache for anybody in the pharmaceutical industry today. However, it is completely justified in its purpose. In light of the electronic health record, the industry is confronting increased regulation. Failure to stick to SOP and cGMP regulation can result in solid punishments including fines, authorizations, and loss of licenses. With the high expenses of non-compliance, pharmaceutical organizations require complete consistent compliance training programs. A learning management framework is a basic accomplice in compliance monitoring and training. Flexible training tends to expand maintenance and decreases the danger of compliance violations. A web based learning framework gives accessibility and flexibility. These advantages are fundamental to an industry that never sleeps. This LMS feature enables pharmaceutical professionals to add interactive images, tables, slideshows, and more for creating courses for different health and pharmaceutical categories such as microbiology, pharmacology and medicine. For instance, if a medical lab is being operated, a lab program might be required for orientation of students with the medical lab. Instructions can be provided on using lab equipment and deliver training on ways for maintaining apparatuses used in the laboratory. LMS for pharmaceutical compliance can be used for scheduling training programs for employees/students and interact with them through video chats, discussion boards, online test evaluations and podcasts. It can also be used for creation of diagnostic assessments for employees to test and then access their grades. This information can be used for documenting employees’ performance. Compliance training through an LMS results in certification which is important in one’s learning path. There are various benefits of certification such as better trained employees, increased company credibility, worldwide recognition of employees, a documented commitment to safety and third-party endorsement of employees’ skills and knowledge. A good LMS provides authentications of culmination of courses in pharmacology, science, and other research subjects that consent to American Society for Clinical Pathology (ASCP), American Medical Technologists (AMT), and state licensure. Earning certifications also tends to motivate employees for actively pursuing ongoing training. Moreover, the FDA (Food and Drug Administration) has made it compulsory for the pharmaceutical industry to implement those processes which are in compliance with Title 21 CFR Part 11 of the Code of Federal Regulations. Hence, compliance certification becomes extremely critical. LMS also provides users with regulatory and compliance courses that help businesses to abide by norms like SOP and CFR Part 11 compliance and also deliver services in accordance to predefined laws, standards, policies and regulations. Compliance reporting is one key feature where learning management system can work for pharmaceutical companies. The LMS can provide audit trail of the company to help meet all HIPAA and FDA audit requirements. While organizational leaders know about the significance of training for compliance, Compliance Next detailed that 30 percent of consistence experts in the U.S. try not to gauge the viability of their consistence programs. It’s difficult to state precisely why this is, however it could be on the grounds that compliance training is hard to follow. With the right tools, the pharmaceutical company can simplify regulatory compliance and training according to their specific requirements so that they can focus on the more significant tasks at hand. In the long run, investing in the right and proper LMS will not only save the company money through better compliance management but it will also establish credibility among competitors and peers.